The curtain for Stephen Unwin's Buxton Festival production of Donizetti's Lucia di Lammermoor (seen 18 July 2015) designed by Jonathan Freeman, displayed an 18th century watercolour of a ruin, but not a Scottish one, and when the curtain rose there wasn't a sporran in sight. Instead we were presented with a rather gripping drama of warring Camorra families set in something like 1940's Sicily. It perhaps lacked the element of local colour and display which some in the audience would have preferred, but Stephen Unwin had paid the opera the compliment of taking it seriously on its own terms and making a vivid music drama. Elin Pritchard sang Lucia, with Adriano Graziani as Edgardo, Stephen Gadd as Enrico, Natalie Sinnott as Alisa, Richard Roberts as Normanno, Bonaventura Bottone as Arturo, and Andrew Greenan as Raimondo. Stephen Unwin directed, with designs by Jonathan Freeman, lighting by Malcolm Rippeth and movement by Jenny Ogilvie. Stephen Barlow conducted the Northern Chamber Orchestra. Salvadore Cammarano's libretto for Lucia di Lammermoor is extremely vague about time and place, and has a very insecure grasp of history. Instead the personal drama is presented almost in isolation, so that many productions choose to take their setting from the original novel. But Stephen Unwin seems to have started by asking himself the question, what happens if we simply take the text and music on its own terms. 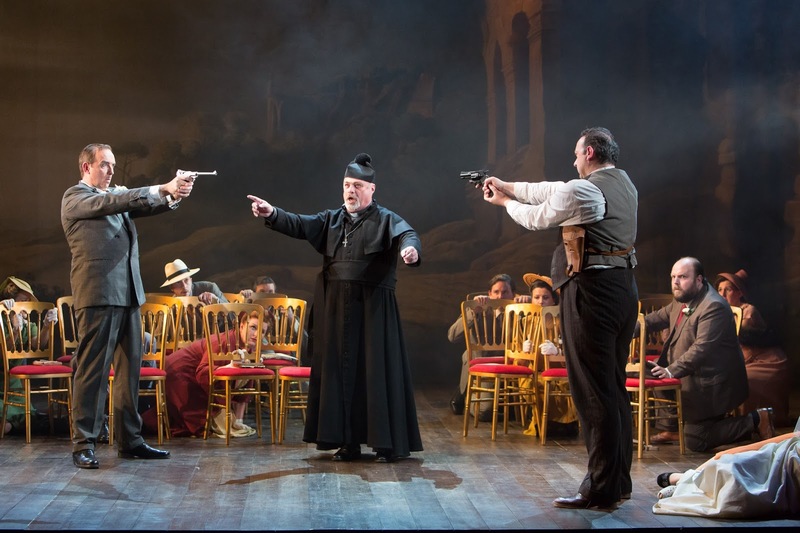 The characters in the opera don't act Scottish, witness the chorus's emphasis in the first scene on 'honore', and the constant reliance on religion. And the 1940's Camorra style backdrop worked very well as a way of articulating the drama without going to the expense of lavish Scottishisms in set and costume. Jonathan Freeman's set really consisted of two curtains, front and back, each depicting an Italian ruin. Within this each scene had a realistic stage setting, an Italian Renaissance fountain, a big desk for Enrico, chair laid out in the hall and with a table for the marriage book, and finally a 19th century Italian style chamber tomb. These quite detailed settings formed the structure around which Stephen Unwin and his performers created a highly detailed and naturalistic drama. Now, Donizetti's Lucia di Lammermoor is an opera not a realistic, and many talented directors have come to grief by trying to apply naturalism to large scale operatic structures. 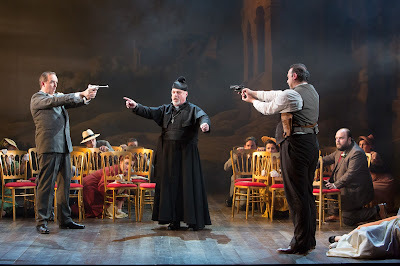 Wisely Stephen Unwin did not try, and he allowed the big musical elements to breath on their own with the stage movement carefully organised to not detract from the essential music drama. This places a great deal of reliance on the singers, and Stephen Unwin and Stephen Barlow drew a very fine performance from the cast. The only major drawback was that each scene required a pause, so that the previous setting could be struck and the new one set. This meant that we had a series of awkward pauses which rather impeded the flow of the drama. We were hearing a very full account of the score, so that scenes like Raimondo's Act Two persuading of Lucia, the Wolf's Crag Scene, and the final piece of drama in Act Three, Scene Two when after the mad scene, Raimondo rounds on Normanno. This makes for a long evening, and gives the singers quite a challenge when it comes to stamina particularly as Stephen Barlow's speeds were pretty steady, giving us quite a traditional large scale reading rather than a more lithe feel to the music. Elin Pritchard is a young lyric soprano, she has sung Donna Elvira (Don Giovanni), Anne Truelove (The Rakes Progress), Violetta (La Traviata), and Fiordiligi (Cosi fan tutte) planned. She has the sort of voice, with a strong middle and lower range, which you can hear will develop in interesting ways and though she has a top E flat she used it sparingly. This Lucia was no senseless canary. There is still a lot of discussion about quite what style of role Donizetti intended Lucia to be, and a convincing case can be made for a spinto soprano, but sopranos who have this combination of heft and flexibility are rare and Buxton wisely opted for a soprano who could make the role her own on her own terms. For Lucia's opening scene, always a very important piece setting the tone for the drama, Elin Pritchard and Stephen Unwin brought in Lucia's unrealistic expectations not by making her already a bit barmy, but by bringing in references in body language to popular culture (music and film) so that it was clear that Lucia saw Edgardo through Hollywood-style lenses. Vocal Elin Pritchard was spot on accurate, but she did not use the fioriture enough, I felt that that musical filigree could have done with more colour and variety. But by the time we got to the mad scene, all doubts were swept away. Elin Pritchard had clearly worked hard to work the scene into her voice, and here was a soprano using the musical elements to create drama rather than expecting us to simply sit and admire. There was, in fact, a great deal to admire, with some beautiful fine work in the cadenzas and though some of the notes in alt seemed to require effort, overall this was a stunning assumption of the role. Thankfully this Lucia was no simpering idiot. Elin Pritchard used her strong middle and lower registers to great effect, and her Lucia was a strong and feisty girl, who was not afraid to be physical and clearly a force to be reckoned with. Adriano Graziani is a young Italian tenor who has studied at the Royal College of Music and at the Cardiff International Academy of Voice. He has a firm, dark toned voice which has quite a low-ish centre of gravity and his repertoire already extends to Don Jose (Carmen) and Verismo roles. I felt that perhaps the tessitura of the role lay slightly high for him, so that at the end of a long evening we were aware of some of the strains in his voice. But he made an admirably virile and vigorous Edgardo. His interventions in Act Two, and the Wolf's Crag scene in Act Three were wonderfully thrilling. In the final scene he gave a lovely and moving account of the cavatina, but the final cabaletta was at times reduced to a series of sobs as Edgardo broke down, a device which was expressive but robbed the music of some of the elegance of Donizetti's design. He was equally virile in Act One, but in this first scene lay the essential problem with his performance as Edgardo. Though vocally firm, his stage persona lacked the sort of charisma and swagger which you felt might have carried Lucia away, nor did Adriano Graziani's interaction with Elin Pritchard elicit the sort of tingling thrill which this scene needs. Donizetti is not really very kind to the tenor in this opera, and there is very little time to establish Edgardo as a romantic hero. Perhaps Stephen Unwin wanted to avoid this cliche, but the opera does need something. Seeing a sober-suited young man making out to a poised young 1940's woman did not quite start their relationship with the electricity it needed. Stephen Gadd made a stylish and very dangerous Enrico. From his first entry, striding on in fur-collared overcoat and very Italian hat, it was clear that this Enrico was both elegant and dangerous. Stephen Gadd sang with his familiar sense of the detail in the drama, and he ensured that his series of interactions with other characters were high octane. He and Elin Pritchard almost struck sparks in the key encounter in Act Two when he force her to marry Arturo, and both Stephen Gadd and Adriano Graziani ensured that the sparring in the Wolf's Crag Scene was both dramatically thrilling and very musical. Bonaventura Bottone was interesting casting as Arturo. Rather older than most singers in the role, this Arturo was clearly the head of the rival family with whom Enrico was keen to ally himself. Bonaventura Bottone's entry in Act Two was a brilliant piece of scene setting, aided by Stephen Gadd's highly speaking body language. Natalie Sinnott made a young, yet firmly centred Alisa. 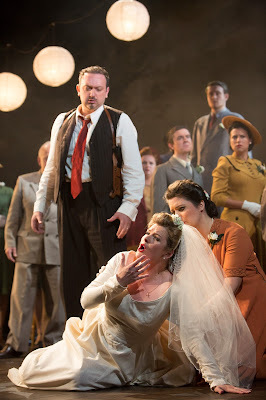 Andrew Greenan as Raimondo made up in impressive physical gravitas for the element of instability in his vocal line. Richard Roberts as Normanno brought a lovely element of danger to the role, though his voice did rather show an element of discomfort. As I have said, Stephen Barlow's speeds inclined to the steady side but he ensured that all the big moments had a centred solidity which is important. This was a big, sober reading which ensured the seriousness of the drama. And the great moments, like the sextet were simply thrilling. In the pit the Northern Chamber Orchestra gave a strong, flexible performance and it was fascinating to hear Donizetti the night after their superb account of Verdi's rather Donizetti inspired writing in Giovanna d'Arco (see my review). This was a production with few axes to grind, and the opera was all the better for it. Having seen Lucia di Lammermoor launch the first festival in 1979 it was lovely to be present in a full house to see the opera again and find the festival on form. I do hope that Stephen Unwin's production gets further outings somewhere, it does not deserve to simply disappear into the annals.